Colours: Too many to list! The Pilot Vanishing Point is one fountain pen which name comes up time and time again. You might not own one but I am sure everyone have heard or read about one. I was always intrigued with the idea of a retractable fountain pen. The idea of having the use of a fountain pen with the ease of deployment of a retractable pen sounds like the best of both worlds. When I heard on the Pen Addict podcast that Pen Chalet was offering a special discount on the Pilot Vanishing Point, I leapt at the chance to get one for myself. Pilot Vanishing Point belongs in the Pilot Capless family which also includes the Pilot Vanishing Point Fermo and Pilot Capless Decimo. Technically, the Pilot Vanishing Point and the Decimo are the same pen the main difference being that the Decimo is the thinner and lighter among the two. Whereas, the Pilot Fermo has a twisting mechanism that pushes the nib out of its housing instead of the pushing mechanism which the Vanishing Point and Decimo has. 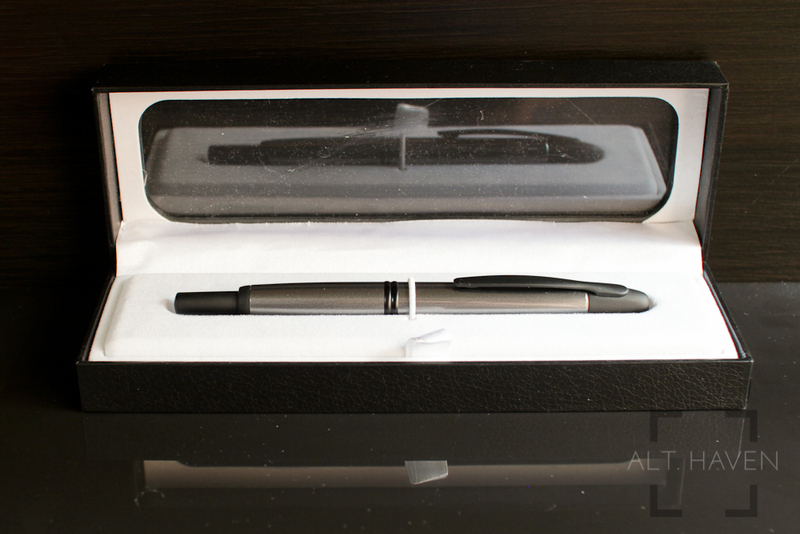 The Pilot Vanishing Point comes in their standard black cardboard sleeve and snap open case. The pen comes with a CON-50 converter as well as a cartridge of blue ink, plus a blind cap for the cartridge. The packaging is pretty regular by all standards. I prefer packaging that don't take up so much space like the Lamy Safari's. I have opted for the gunmetal colour of the Pilot Vanishing Point. The girth of the Vanishing Point is wider than I had expected but it is still extremely comfortable to hold. Though the pen is heavier than what I am used to, the balance of the Vanishing Point is really good. Most of the weight is leaning towards the nib such that the pen almost writes itself. The clicking mechanism works smoothly and it takes a deliberate push to enage the mechanism so there won't be any accidental deployment of the nib. Plus it gives it a premium feel to the entire experience. 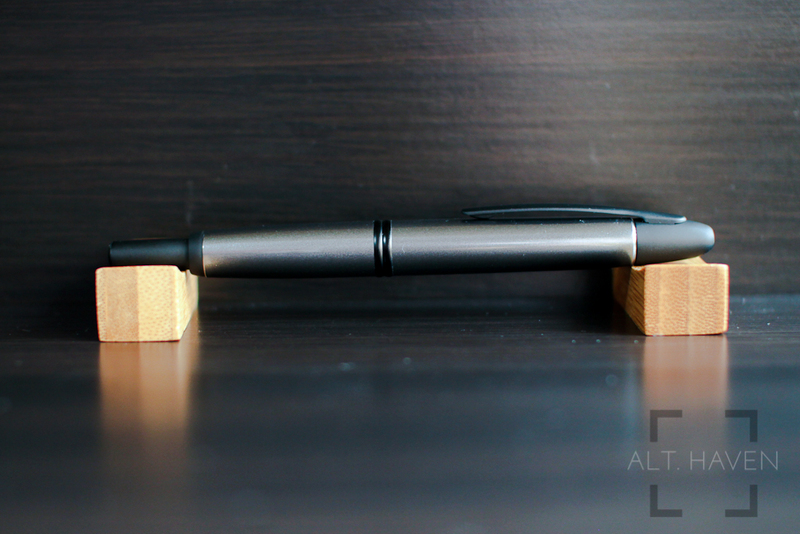 Here comes the infamous clip of the Pilot Vanishing Point. As a left handed writer I found the clip does get in the way of my writing. I don't hold the pen in the standard tripod grip, my index finger is in the traditional tripod position but my thumb wraps around the clip and touches my index finger while my middle finger supports the pen from the bottom. 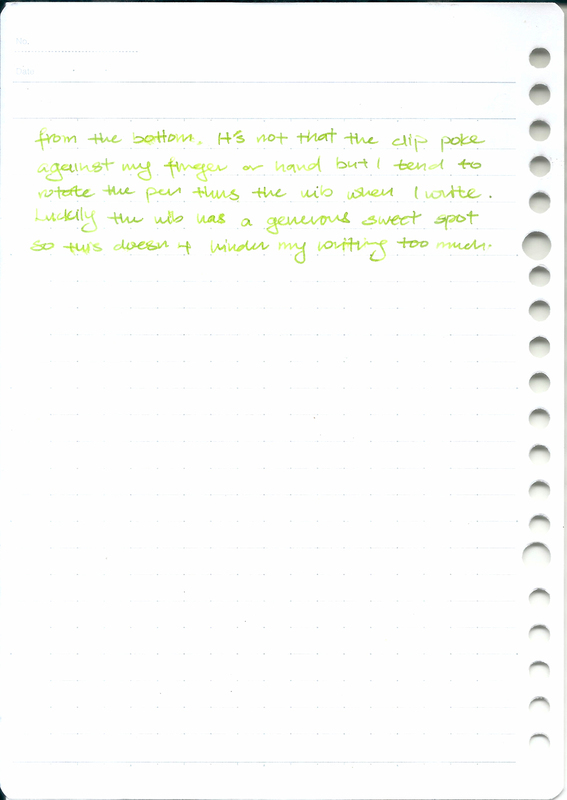 It's not that the clip poke against my finger or hand but I tend to rotate the pen thus the nib when I write. Luckily the nib has a generous sweet spot so this doesn't hinder my writing too much. The Vanishing Point can be disassembled easily for quick cleaning and ink changing. Just unscrew the pen in the middle the two halves comes apart to reveal the nib and the converter or cartridge. The Pilot Vanishing Point comes with a 18k gold nib. I had elected to go with the medium nib. This is my first experience with a modern 18k gold nib. The previous gold nib fountain pen I've purchased was the Lamy 2000 which had a 14k nib. Maybe it's just my imagination I feel the gold nib which the Vanishing Point comes with is softer and spring-ier than the Lamy 2000's. The nib gives a decent amount of line variation if I push the nib. The nib writes wet and juicy just the way some love it but it isn't my preference. I would love it more if it is just a little drier. Regardless the nib is a solid performer. Now maybe all I need to do is to pair it with a drier ink. The first week I had the Vanishing Point at work is almost life changing. Pick up the pen, a quick push and I am off to the races. Jotting down quick notes have never been so fast. After switching bac to a capped pen, I feel hindered and slowed. This is a great pen for people who write in short spurts. The Pilot Vanishing Point is a worthy addition to most people's fountain pen collection. The best way to purchase this pen is to touch and hold one at a fountain pen meet before throwing down money for it. Disclaimer: I got the Pilot Vanishing Point at a discount from Pen Chalet. This has in no way influence my opinion on the pen reviewed.